The last backpacking trip I wrote about mentioned how easy and glamorous backpacking could be, Copper Ridge Loop was the complete opposite. Copper Ridge Loop is a 36 mile permitted loop in North Cascades National park. There are seven campgrounds on the trail. 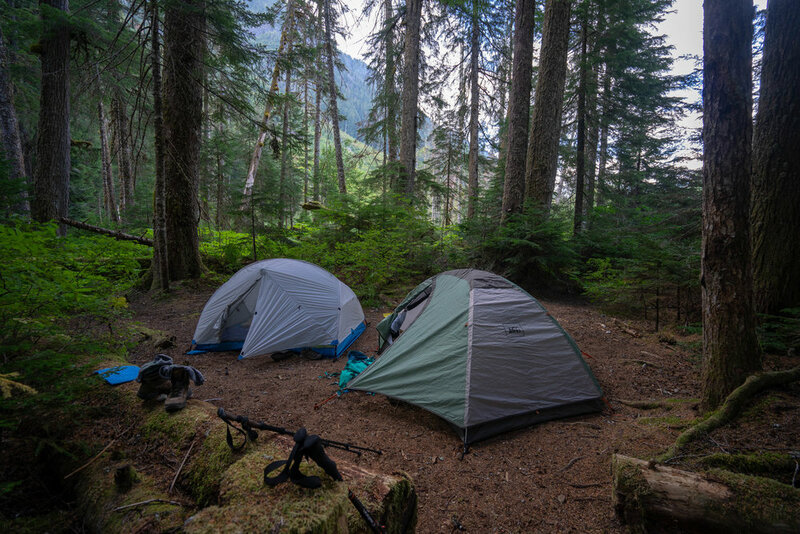 The amount of time you take to complete the loop will depend on your hiking ability, and which campsites you are able to get permits for. We opted to do the trip in three days and two nights over Labor Day weekend. Each day was between 10-13 miles of hiking. 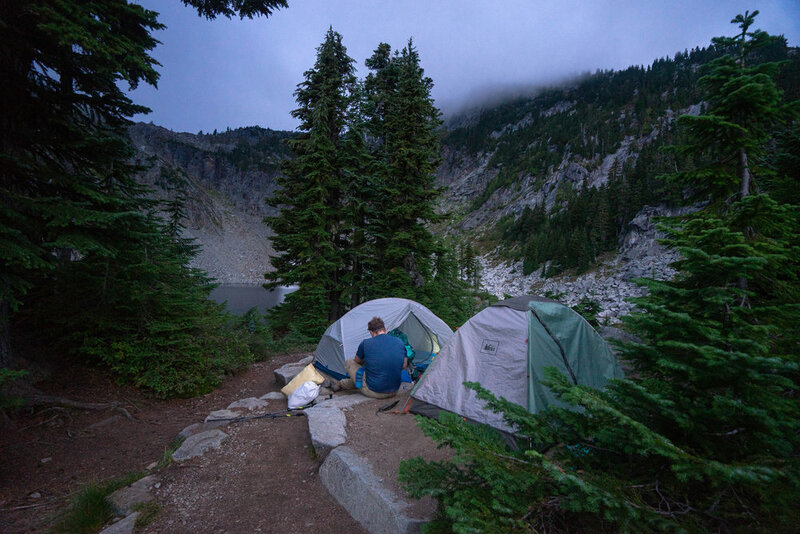 60% of backcountry permits in North Cascades National Park can be reserved ahead of time during the application window of March 13th - May 15th. The other 40% of permits are left unreserved for walk-up parties, so don’t fret if you don’t get your hoped for itinerary during the application window. Doris applied for our permits in March because we were going over the busy Labor Day weekend and we like to plan ahead. 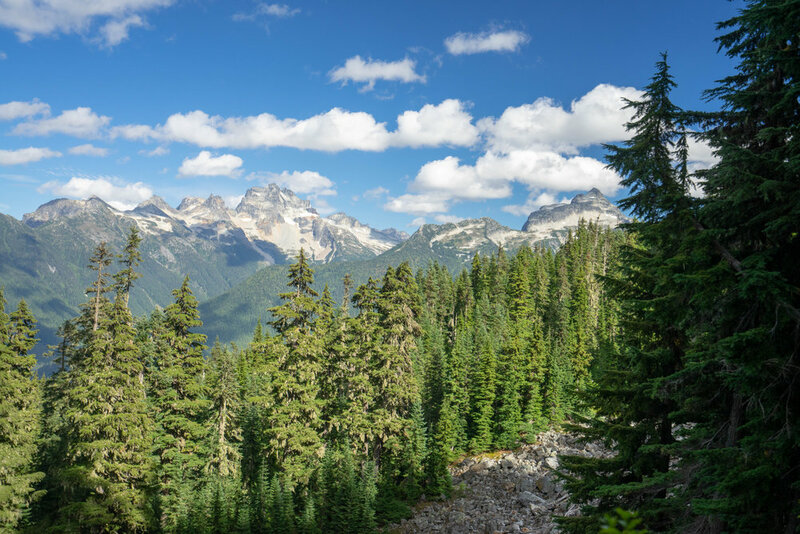 You can find more info about the North Cascades backcountry permitting process here. Here are the details of our trip! When we arrived at the trailhead I realized my pack was the heaviest of all our packs at 40lbs. I took out some unneeded items since carrying that much weight seemed hellish for three 10+ mile days. After I had my pack situated we started our way up the trail around 9:30am. Hannegan Pass Trail is outside of the National Park so you can bring dogs there and up to Hannegan peak. If you continue on to the Copper Ridge Loop you enter the National Park and dogs are no longer allowed. Starting out on the Hannegan Pass trail. We made it to Hannegan Pass around noon and stopped for a quick lunch before continuing on the trail. When you reach Boundary Camp you are greeted by the North Cascades National Park sign, and the split for the different directions of the loop. Our first camp was US Cabin Camp so we took the trail to the right and descended further into the forest and valley. Quick blueberry break looking out at Ruth Mountain. The trail generally goes downhill the majority of the the way to US Cabin Camp. It’s forested with not much in the way of views. We arrived at US Cabin camp around 4:30pm. There are four campsites. Two close to the trail and two close to the river. The two close to the river are better since they are close to the river and more spacious. The campsites closer to the trail are closer to the pit toilet so it depends on what you prefer! While there is a pit toilet at this campground there is no food storage. You either need to bring along a bear can (it is not required) or hang your food. We opted for hanging our food in our Ursacks which was a little difficult. This campground doesn’t have the best bear hang trees. We had an early dinner and watched the sunset on the riverbank after struggling to hang our food. We went to sleep early since we had taken to jokingly calling our second day the, “Hell Day” and wanted a lot of rest to prepare. Setting out on the trail on day two! Hell day proved to be an accurate description for this day. It started out innocent enough. We laughed and joked while making breakfast before setting off on the trail. Then we enjoyed the infamous cable car crossing over the Chilliwack River. On our final riverside part we met with friends for lunch who were doing the loop in the opposite direction. They tried to downplay how tough our hike ahead would be, but I had looked at the map and knew we were in store for a treat. Doris and Cody coming across on the infamous cable car! Brooke and I preparing to make our way across! After the final river crossing you have 13 long and steep switchbacks ahead of you, and the climb doesn’t end when the switchbacks do. It keeps going in what feels like one never-ending final switchback. Overall, you end up climbing 3000 feet in under three miles. Once you make it to the top of this part you get your first amazing views, so the climb is worth it! First view after coming out of the long uphill slog through the forest! Doris says I have a tendency to “rage-hike” and disappear, and she isn’t wrong. On this painful portion of trail I took off and started plowing my way up the switchbacks. I realized a little too late I was too far ahead and I couldn’t get ahold of Doris on the walkie-talkie. This part of the loop is not popular and I didn't see anyone on the trail after leaving my group. After hearing a large animal crashing around in the woods next to me I was feeling paranoid. I started scream singing songs hoping to scare away the bears I imagined all around me. Finally, after what seemed like forever, I heard Doris’s voice come through the walkie-talkie asking me how much longer the hike up was. I enjoyed the views and rolling up and down of the trail on this part of the ridge and rolled into the Copper Lake Campground at six pm. There are three campsites, bear vaults, and a composting toilet at this campground. In a cruel twist of fate you will hike below the campsites for about a quarter mile before you turn off the main trail to hike to them. I picked a spot with two tent pads that had a view of the lake and was close to the bear vault and composting toilet. I was thankful to see a bear vault since we had struggled so hard with our bear hang the night before! I set up our tent and started radioing Doris every ten minutes or so to ask where her and the rest of our group were. I definitely received my fair share of nasty replies. Around 7:30pm they made it into camp and didn’t seem too happy about the hike. The second Brooke set down her pack I grabbed our food bag (she carried the food and I carried our tent due to pack size constraints) and started making us dinner while she nursed the massive blood blisters that had formed on her heels. We all ate dinner and passed out in our tents. No one was excited for our next day on the trail. Caught this sunset while I waited for my group! I woke up super cranky on this day. It was rainy and windy the night before and many times I was awoken by our tent wall being blown into my face. We decided to pack up quickly and eat breakfast at the Copper Mountain Lookout. The only problem with that is it was another 1000 feet of gain in a mile hike to the lookout. Doing that on an empty stomach was one of my most miserable moments on the trail. When we arrived at the lookout the wind had brought in even more clouds and the views were completely socked in. It was a bit of a bummer after all the hard work we had done to get up there. After breakfast my inclination to rage hike kicked in again and I took off down the trail. Overall you lose a lot of elevation on this portion of trail, but that doesn’t mean it is down the entire way. It’s one of those infuriating trails where you lose elevation, then immediately gain it back over and over again. I was definitely filled with rage until the clouds started to clear and I was gifted with a gorgeous view of Mount Shuksan after passing Egg Lake and Silisia Camps. First glimpse of mountains after the lookout. Mount Shuksan makes an appearance while Baker hides behind the clouds. I reached the Boundary Camp trail junction and chatted with a bunch of different backpackers who had finished other sections of the loop. My plan was to wait for Doris, Cody, and Brooke but after a half hour passed I decided to keep going and wait for them at the top of Hannegan Pass. Earlier in the trip I had talked about hiking the mile up to Hannegan Peak from the pass, but once I arrived at the pass my feet were feeling awful and I realized I probably should have tackled it when I was fresh. When Doris, Cody, and Brooke arrived I grabbed the car keys from Cody and got back to rage hiking back to the car. Hannegan Pass to the parking lot is a beautiful portion of trail, but when you are finishing up the Copper Ridge Loop it is the most MISERABLE part of this trail. It’s a downhill rocky slog that feels like murder on feet that have already done so many miles. I kept thinking I was SO CLOSE to the car but would look at the map on my phone and realize I had only gone a quarter mile or so. At one point I was starting to sink deep into self pity and would visibly wince with every step I took. I knew I wouldn’t get far with that attitude so I returned to scream singing songs and it helped me snap out of my terrible mood. I finished at 3pm and slept in the back of the car until everyone trickled in around 4:30. We drove into Bellingham and celebrated conquering this beast of a loop with much needed burgers and fries at a local drive in. Planning your own Copper Ridge Loop trip. There are many ways to break up this loop, some people (superheroes) even trail run it in a single day! It all depends on which campsites you are able to get in the lottery period or in a walk up permit. After my experience I think the most enjoyable way would be to add one more night and stay a night at Boundary Camp, a night at Indian Creek Camp, and a night at Egg Lake or Silisia Camp. If you are short on time and in good backpacking shape a three day two night trip still works!